The view of the river, from a street in the Mouraria neighborhood. I spent most of this past Wednesday walking through the Mouraria and Graça neighborhoods, where the characters in my work-in-progress live, tracing their steps and trying to imagine what life was like for them in 1966. It’s a lot harder today than it was when I first walked those streets in 2012. Mouraria, especially, is one of the fastest-gentrifying neighborhoods of Lisbon. Its proximity to downtown, the picturesque Castelo de São Jorge, and public transportation have made it a desirable location for boutique hotels and B&Bs. Next-door Alfama, considered the birthplace of fado, gets most of the tourist traffic (including the detested tuk-tuks), but the once-shabby apartment buildings of Mouraria have been fixed up and freshly painted in white and pastel colors. 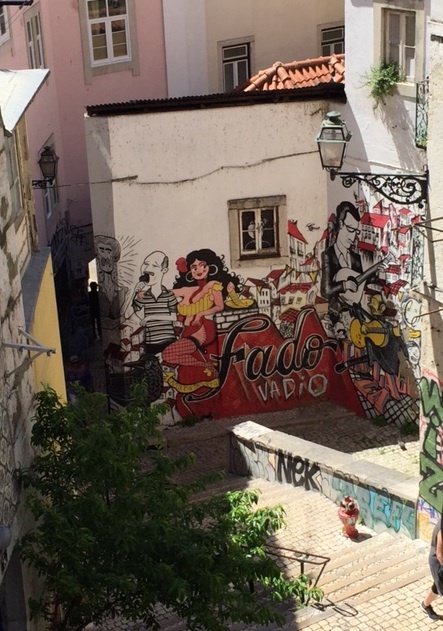 A mural recalls Mouraria’s past as a center of fado. 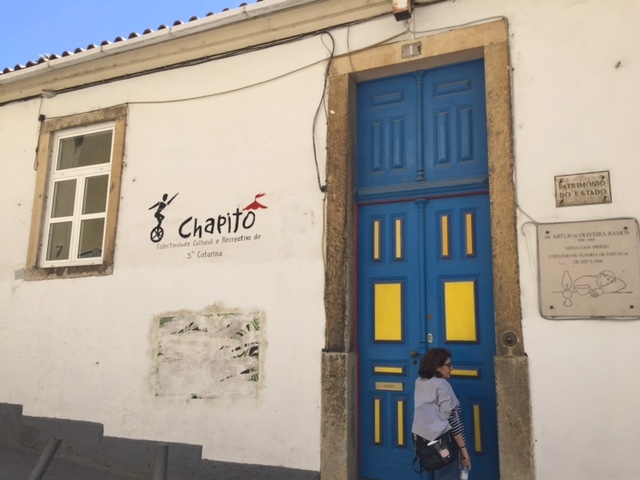 Of those three neighborhoods, I chose Mouraria for the setting of my novel because my protagonist could walk to work — both the fish market along the river and the fado restaurant that her sister’s in-laws owned — and her route home from the market took her past a prison known as the House of Silence for its notorious isolation cells. Located outside the walls of the Castelo de São Jorge, the area has an unprotected feel, as those who lived outside the castle walls in medieval times were far more vulnerable to enemy attacks. Among the prominent buildings of Mouraria’s past are the Sé (Lisbon Cathedral), a convent (now a church), three other parish churches, and a school for orphaned boys; more recent additions include a recreational center for disadvantaged children and the Casa da Achada community arts center. In the twentieth century, religion played an important role in the community, as it does in the life of my protagonist, and the community spirit of the residents lives on today through other institutions as well as through the church. We knew some children who attended a circus school at this community center. 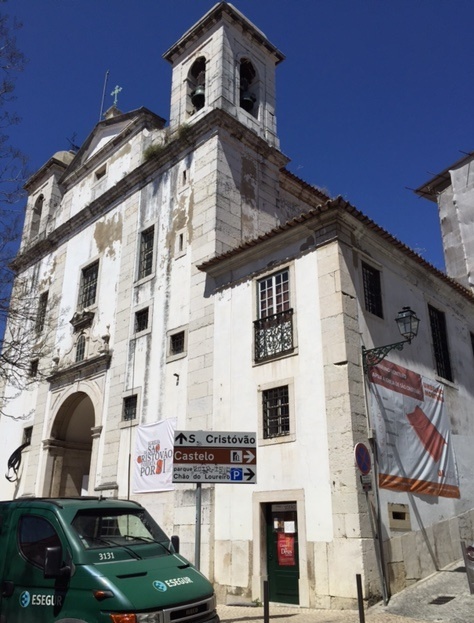 On my research itinerary was the São Cristovão church, and I saw right away that the church — one of the prettiest in the area — is undergoing a major, 1.2 million-euro renovation. In the meantime, there’s a sculpture exhibit, and I sat in on a class of architecture students learning about church design and renovation and the symbolism of Rui Chafes’s “Ascensão” sculptures, six in all of iron and lead. The São Cristovão church, dressed up for renovations. In addition to the modern sculptures, the church contains a variety of traditional religious sculptures, the most prominent being Saint Christopher carrying a baby Jesus who holds a small globe with a cross on top. Above the sculptures are paintings that cover most of the walls. Dark colors dominate, so much so that I couldn’t make out many of the scenes. The church floor is marble and the ceiling, painted wooden planks. Ornate trim of gilded metal and dark wood and dark marble molding between the walls and ceiling contribute to the gloomy but serene feel of the space. Apparently, the restoration involves cleaning the paintings, sculptures, moldings, floors, and ceiling (as well as a lot of work on the outside), and the church’s interior should be somewhat brighter afterward. Because several of the windows were also covered up, I could not take photos inside the church without flash, but you can see what the interior looks like here. (I didn’t see the pews either because those had already been taken out for the renovation.) After São Cristovão, I saw a smaller, less ornate parish church at the edge of Mouraria near the Martim Moniz metro station. That church, Nossa Senhora de Saúde, was celebrating a well attended evening mass when I arrived. Map for a Mouraria walking tour. For my protagonist whose grief and despair make her question her faith, the church is a touchstone, mirroring her spiritual struggles. How does she see its dark interior? Is it a cool, peaceful refuge from her daily life, or does the darkness reflect the state of her soul? Does the interior simply feel cold like death? How does the ornate interior contrast to the bareness of her apartment, an apartment that she and her mother may soon be too poor to afford? I’ve written my first draft without much detail in the three or four scenes that take place inside the church, but these are questions I ask when going back to revise these scenes. My novel, like the church, is in the process of renovation, but fortunately, the work won’t cost me 1.2 million euros! 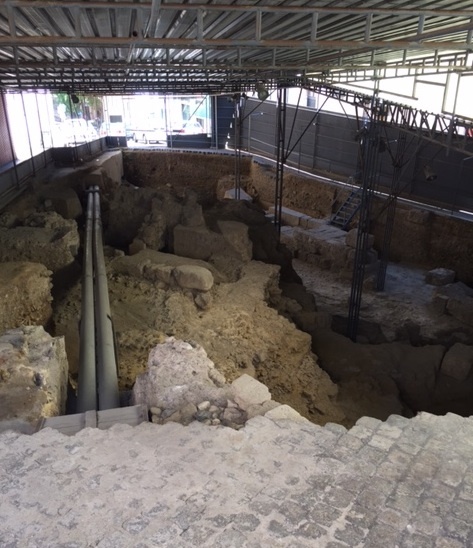 Excavating the Olisipo theater from Roman times. 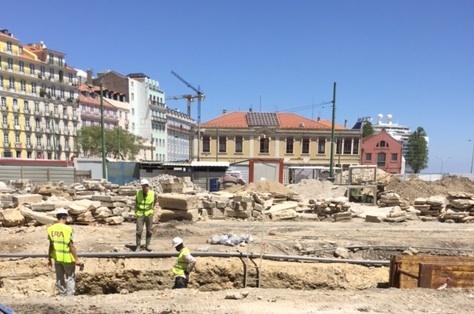 In a small triangle where three streets come together, and again in a large space bordering the river, crews were digging for ancient Roman ruins. 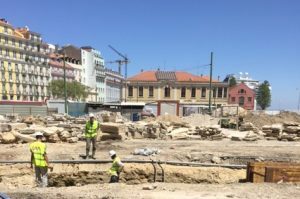 The triangle is near the Roman art museum, and there the ancient Lisbon theater, the theater of Olisipo as the Romans called the city, has been discovered. The excavation is in its early stages, but by the time it’s done, visitors will see the remains of a theater that held around 4000 spectators, with a large stage that guaranteed no bad seat in the house. 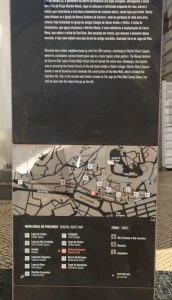 I couldn’t find much information for the excavation between the Rua da Alfândega and the river, but an older map indicated that government buildings occupied the site. That makes sense, because “alfândega” means “customs.” But now I have no idea what my protagonist saw as she walked along that street; all I can do is infer from the surrounding buildings. Not sure what this was, or what they’re going to find. Stay tuned. 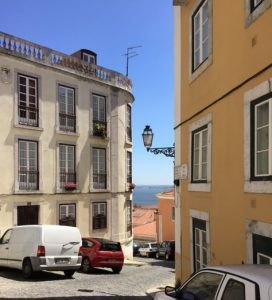 Back in 2014 when I first started to think about writing a historical novel set in Lisbon in the mid-20th century, one of the advantages, it seemed to me, was that the historic city was relatively intact. That, however, is changing quickly. I wouldn’t go so far as to say Lisbon today is as unrecognizable to old-timers as, say, downtown Brooklyn or Manhattan’s East Village, but I’m doing historical research on a moving target. 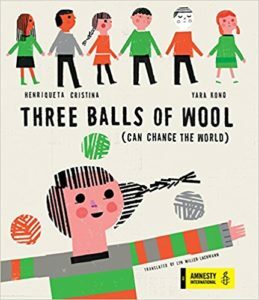 And if it means life for the Portuguese people is better today than it was 50 years ago, that’s a good thing. I look forward to learning more. Is there a place you’d recommend for us for fado? I’ve been to two places, one in Alfama and one in Graça, but I didn’t think either one was that great, and the online reviews back me up. However, a friend of my mother’s went to O Faia, in Bairro Alto, and recommends it, as do the reviews online. Here’s the link for more information: http://www.ofaia.com/ I also suggest going to the Museu do Fado, because you get a sense of the genre’s history; a lot has changed over time. Thank you! I’ve added this to my calendar. This is fascinating,Lyn. What a privilege to be allowed into your research and creative process. Thank you!